Today I was out with Cedric Bernardini. As is the norm this week it started with -20C and we elected for a leisurely 10 am start from Chamonix. At GM the wind howled ready to instantaneously freeze and exposed skin bringing the temperature to nearer -30/35C. Without speaking we descended rapid style to the glacier and started the skin up going fairly fast to get warm, only removing down jackets (I have been wearing 2 all week to ski ontop of the other 5 or 6 layers). We watched 2 people in front wading up the couloir and were glad that someone else was breaking trail but by the time we got to the base and made the transition all the tracks had filled in with windblown snow. Toping out was exciting with the skis on our back causing a lot of lift. Col du Passon was particularly inhospitable today so we transitioned back to skis with alot of urgency and got moving down the ridge searching out the top of the couloir. Cedric quickly zoomed over to the demi lune and after I joined him made a start down. The snow looked very variable and I lead through keeping close to the rocks on the left and skiing wavy soft snow, not liking the look of the windpacked smooth gully bed. Cedric lead the next pitch and as I approached him there was some drop off in the gully bed – initially it looked like it was going to be an icy step but as I came closer it became obvious it was a substantial crown wall. As I joined Cedric we became concerned about the team that had been in front by 45 minutes. The debris trail led all the way from the bottom of the couloir across the open slopes and over the cliffs down to the Argentiere Glacier, approx 1.5 km. 2 sets of fresh tracks lead out right from the base of the couloir so we concluded the slab and gone off after they skied. At least we didnt have to worry about slabs any more, just skiing the icy bed layer. Out the bottom of the couloir and right of the debris the snow was amazing and a few turns brought us down to the exit couloir to the glacier. Here we spied two groups of Chamois precariously climbing up the cliffs and onto the slopes above. We waited until they were all on the snow above and there was no danger of them knocking rocks down before skiing into the couloir below. Here the big avalanche had scoured all the snow leaving anything from icy spurs to breakable crust at best. Going over the final rollover to the glacier wasnt much better with crust and ice on 45 degree slopes. Arriving on the glacier ontop of avalanche debris Cedric turned to me and said in his usual understated manner ‘well, we made it’! A final few turns down the glacier and a choice of which side of the river to go (we chose wrong), sliding past the Cremerie ice falls where climbers were hammering at ice like iron, and a snow covered Cremerie boulder field and we were down. I had taken my good camera with me but the battery died instantly in the cold but here is one of Cedric’s shots from Facebook. 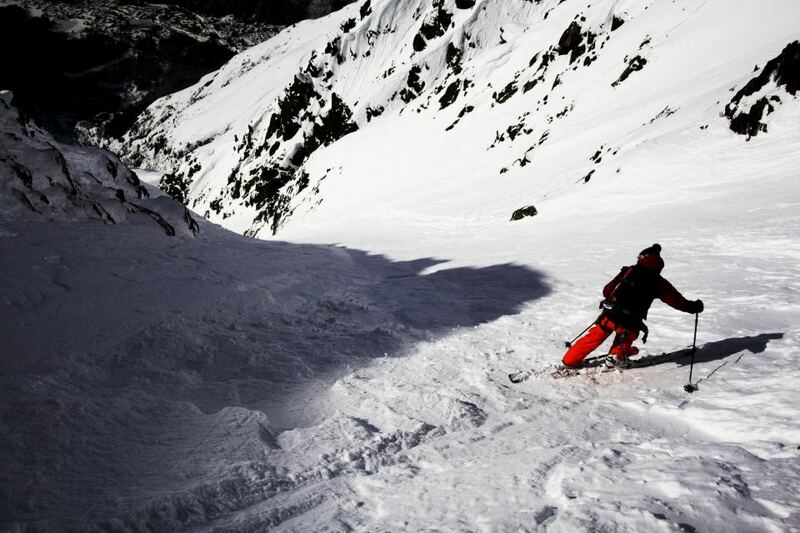 This entry was posted in Skiing and tagged Cedric Bernardini, Couloir Vallencent by Ross Hewitt - Skiing, Climbing, Photography. Bookmark the permalink.